Strong, durable, and completely mobile, this heavy-duty work surface supports up to 250 pounds with casters that provide portability yet are lockable for safety. 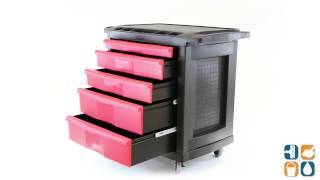 Offering up to five multi-depth storage drawers for tools, supplies and more, the Rubbermaid Mobile Work Center is the perfect tool for any handyman. 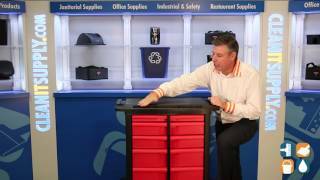 From residential do-it-yourselfers, to commercial and industrial construction workers, this sturdy and reliable tabletop comes complete with multiple bins to keep small parts within reach. From its peg board side panels that provide convenient tool organization, to the built-in cord wrap that allows neat storage of power tools and work lights, the Five-Drawer Mobile Work center is the perfect construction-site addition. 4" Locking swivel casters. Dimensions: 32-5/8"L x 19.9" W x 33-1/2"H.